Potatoes have made their debut at the green market, and I am finding it hard to resist picking them up every week. My favorites are the little baby fingerlings and the purple potatoes, but I am running out of ways to prepare them and I don't always want to turn on the oven to roast them, especially right now in the middle of summer. I could use the slow cooker method I recently discovered, but that's only good when I have a whole mess of potatoes I need to cook up. Lately, I have been boiling them. It's quick and easy and doesn't involve a lot of thought. I just wash them and put them in a pot of cold water, bring it up to a boil, add salt, lower the heat, cover, and let it cook for 15-20 minutes, until a knife inserted into one of the potatoes goes in and out smoothly, without any resistance. After that it is a quick matter to dress it up in something fancy and take it out on the town. These boiled fingerlings with lemon, garlic and parsley make a quick side dish to make any entree proud. 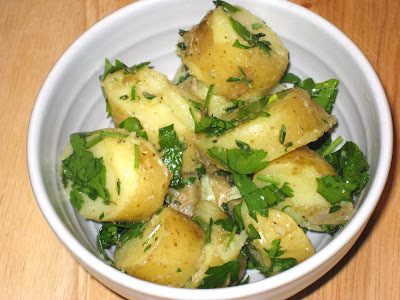 It's a quick take on gremolata, with which I have long been intrigued. Wash potatoes and place in 3-quart saucepan with cold water. Bring to a boil. Add generous amount of salt, lower heat, cover, and cook for 15-20 minutes, until a knife inserted into a potato goes in smoothly and comes out easily. Drain potatoes. Depending on their size, either leave them whole, cut them in half, or slice them into 3/4-inch pieces and put in a large mixing bowl. While still hot, add oil, garlic, lemon zest and juice, parsley, salt and pepper and mix well. Serve immediately. Full disclosure: The potatoes in the above picture were made with garlic powder and without the lemon zest, but you get the idea.